The Sovereign is a title imposed upon those chosen to lead the terrorist sect called the Cabal. The Cabal is a Terrorist Cell that wages a "holy war" against all belief structures, saying that the old beliefs are too rigid and outdated, and that the true answer is found through the belief of Universal Synergy; combining all ideas to create a newer, more flexible belief structure. Their Philosophical War also extends to attacking and decimating extremists groups, citing them as "violators" of the pure ideology. Recently, The Cabal has waged war against Scientology and Atheism, calling them hypocrites in that they decry and find fault in the established belief structures, yet utilize the same exact ideas and vitriol to justify their beliefs. These are the justifications of the Cabal and their war is worldwide, ala Cobra or Hydra. The Sovereign's role within the Cabal is the Speaker of the Word, pirating network signals to spread their ideas and convey messages to their operatives. They rally the workers and soldiers who fight for their cause, while overseeing the development and implementation of The Cabal's operations. The Title is super-secretive that only the Sovereign's Personal Guard, the Acolytes, are allowed to see the Sovereign without their mask, adding mystery as to the process of who becomes the new Sovereign. The Sovereign's design is based on the Egyptian motif as a tribute to Akhenaten, the ruler who tried to bring monotheism to polytheistic Egypt. They believe themselves to be the sole answer to all the worlds ills, therefore making the Cabal zealots and hypocrites in their own right. The costume has a blood motif, signifying the blood spilled in spreading their ideas. The symbol on the eye-piece is a cross mixed with a crescent moon (or "C" for obvious significance). 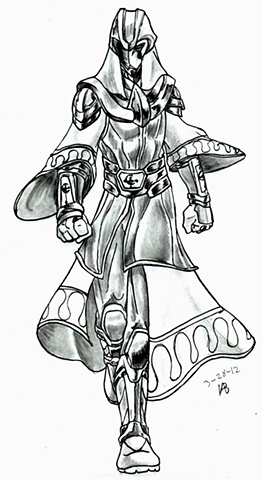 The outfit is of flowing robes to signify ceremonial aspects, yet not too long to inhibit movement, as the Sovereign is not afraid to fight alongside their troops. The Cabal was created as my way of developing a threat like Cobra or Hydra from my childhood, yet designed them as individuals who would attack both physically and emotionally by attacking the very core of people's ideas and beliefs. No one likes to have their beliefs attacked, yet there are many who feel it is their right to tell you that your way is wrong and that their way is right. Recently I expanded on the Cabal to target Atheism as a threat to their structure, based on the numerous Digg comments and people's pretension that believing in something is one of ignorance and stupidity. These blanket statements make such a group no different than the same belief groups chiding and belittling other groups as" ignorant" or "stupid" which would anger a terrorist group. Another reason, is that I like villains who have that sense of moral gray in that you can/can't agree with their ideas. On one hand, their philosophy sounds intriquing, but they spread their word through violence and bloodshed. The condemn terrorists, yet commit acts of terror. They believe in a Universal Truth, yet only if you follow their line of thinking. While I admit, some of these are based on my own ideas, I would never condone taking life or imposing my will to make others see my line of thinking. This is, after all, a work of fiction and the character is just that, a character.